I can tell you the last three times that I’ve worn make up. 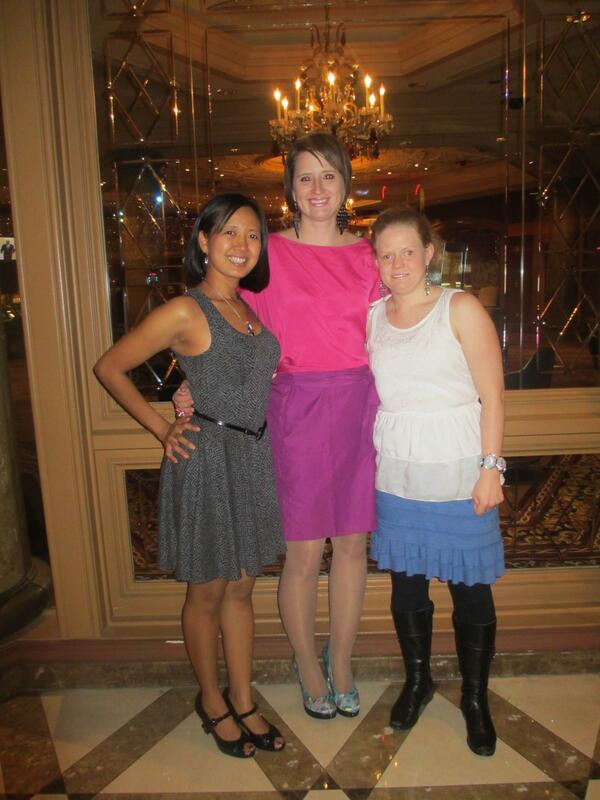 Last night, at a friend’s wedding where I was a bridesmaid in 2008, and at my own wedding in 2007. I haven’t owned any make up since 2007, and since my daughter destroyed the last of my shimmery lipgloss a few months ago, I haven’t bothered to replace it. I always used the excuse that I don’t like to wear make up because I don’t need it. Yes, that is partly true. I rather do hate the way it feels on my skin. However the main reason is that I’ve never truly felt comfortable with applying it. Crazy since I love all other things girly like clothes, shoes, purses, and jewelry, that I can’t even apply my own make up. 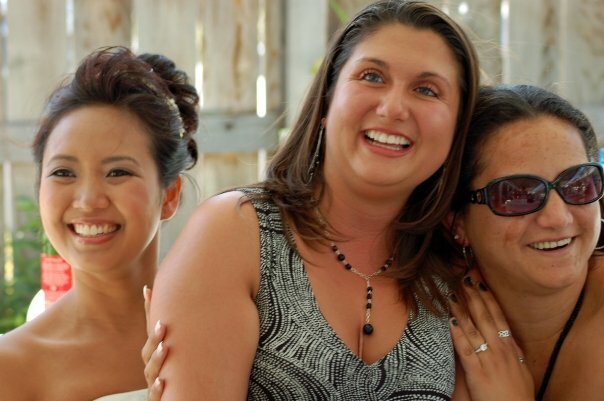 Here’s a great candid from my wedding of me and two of my best gal pals, Yolanda and LM. These are two very confident and beautiful blind women. I know plenty of blind women who wear make up daily. I’ve been part of plenty of seminars teaching blind youth about beauty tricks and tips. but when it comes down to it, I am 30 years old and I can’t even put on my own make up. Don’t think that this is an, “Oh poor me, pity party,” blog post. This is more of a self admission of the truth. Why should I let this bother me and make me feel any less feminine? That’s me in the same outfit I wore last night, but this was last January with my friends Deja and Jessica, also two stylish blind bloggers. This weekend I had one of my oldest and dearest friends in town and my husband and I join her and her friends for dinner and dancing. I decided to wear my fit and flare snake skin print dress from Express, black peep toe Maryjane pumps, a thin black belt, my black coral necklace I bought in Hawaii, and dangly silver and black earrings. Something seemed to be missing. Especially if I was going the Hakkasan Nightclub, supposedly the “It” club of the season. I thought about leaving early and stopping at Sephora or Mac for a little makeover and picking up some basics, but that would mean leaving the baby sitter would need to arrive earlier, and we already planned to have her for ten hours with the kids. So I sucked up my pride and asked a good friend if she wouldn’t mind stopping by to help me out with my make up. She did an incredible job. 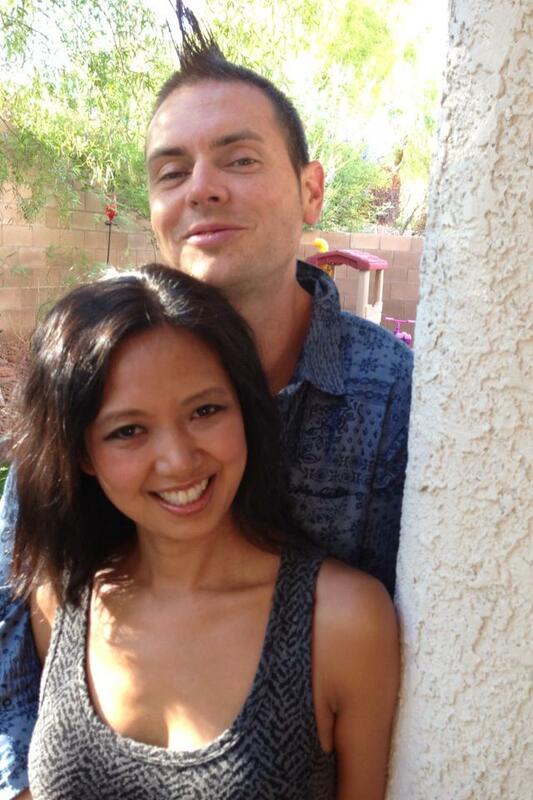 There I am with hubby all done up before heading out to Las Vegas Blvd for the night. Now that I am 30. my skin isn’t as great as it used to be. The dry climate has perpetuated a constant cycle of dry/oily skin. I think it’s time I start looking into doing a little bit more for my face. And for those evenings where I want to get dressed up and look just a little bit glamorous, maybe it’s time I invest in some basic essentials in the make up department. Posted on August 19, 2013 by MamaRupp	• This entry was posted in Uncategorized and tagged Blind, confident, glamorous, Make up, makeover, mommy. Bookmark the permalink. Thanks Deja. Any tips on applying it non visually? I personally don’t like wearing much makeup and often wear nothing. Occasionally, I bust out the lip gloss, or gasp, the lipstick. And, I know how to apply it…except for the eye gunk. No shame in asking someone to help you apply it. You know why? There are plenty of sighted people who can’t apply their own makeup either. So … just remember when you’re worried about not dolling up with the paint, blind people are a cross-section of society. Thanks LM. Your mom is so sweet. I would like to be able to apply it for those rare occasions where I might want to wear make up. I am however, very thankful to have nice skin and not need to wear make up regularly.